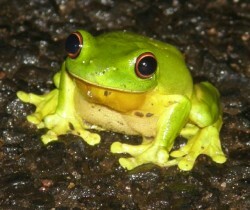 Frogs are unusually diverse in Australia, with approximately 211 native species. All but one is endemic either to Australia or to Australia and New Guinea. Australian native frogs are currently classified into four families Hylidae, Myobatrachidae, Microhylidae and Ranidae. 91% of Australian species belong to the families Hylidae and Myobatrachidae. These families are now thought to be endemic to Australia and New Guinea, but related to South American families via a common Gondwanan ancestry. Species belonging to the Myobatrachidae family of frogs are terrestrial or aquatic, with no arboreal species. These frogs range in size from the very small (eg. Crinia signifera is between 18-28mm) to very large (Mixophyes iterates can sometimes be over 100mm) and are found in a wide variety of habitats such as coastal areas, eucalypt woodlands, rainforest and semi-arid/arid zones. Species belonging to the Hylidae family are generally known as tree frogs with members generally found to have slender bodies and adhesive toe pads. However several members of the family are also found in a range of habitats. For example, species placed in the genus Cyclorana are known to burrow into the substrate to avoid extreme weather conditions. This is a particularly advantageous adaptation to life in the harsh Australian outback! There are no toads, newts or salamanders, although several ‘bumpy’ species of frog are called ‘toads’ or ‘toadlets’. One species of toad, the cane toad (Bufo marinus) has been introduced with disastrous effects on our wildlife. The cane toad produces the characteristic bufotoxin as a defensive mechanism and as there are no true toads native to Australia, this toxin is particularly devastating to native animals known to include frogs in their diet. Species such as the Red-bellied Black Snake (Pseudechis porphyriacus) and young Fresh Water Crocodiles (Crocodylus johnsoni) have been known to die from ingesting cane toads. The introduction of cane toads to Australia is now used as a case study throughout the world for learning the negative consequences of invasive animal introductions on native wildlife. 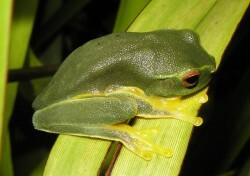 Australia is home to variety of unique and unusual frog species. 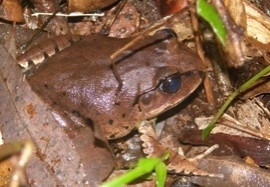 The Holy Cross Frog (Notaden bennettii) is found in western Queensland and New South Wales. This species is known to burrow underground and emerge under heavy rainfall events to breed. These frogs exude a sticky and elastic “frog glue” which has been found to be an incredibly effective adhesive and is now the subject of further study for biotechnology purposes. The Green Tree Frog (Litoria caerulea) is a very well known frog to both Australians and people overseas. This frog’s placid demeanor and large size make it a very popular species of frog to keep in captivity. These frogs are regularly found in urban areas and human settlements as these areas tend to have ample sources of standing water (toilet blocks and water tanks) as well a seemingly ever present source of food due to human lights attracting insects at night. Australia is well known the world over for its native marsupial mammal animals but few people know it is also home to a frog known as the “Marsupial Frog” (Assa darlingtoni). This frog has special “hip pockets”, similar to the pouch of marsupial mammals, which allow the male to carry young tadpoles with him until the tadpoles are ready to metamorphose into adult frogs. Found in a small area of mountain forest of southeast Queensland, this frog is one of the more unusual species found in Australia.